Industry Leading Data. Robust Analytics. Investor Perspectives. 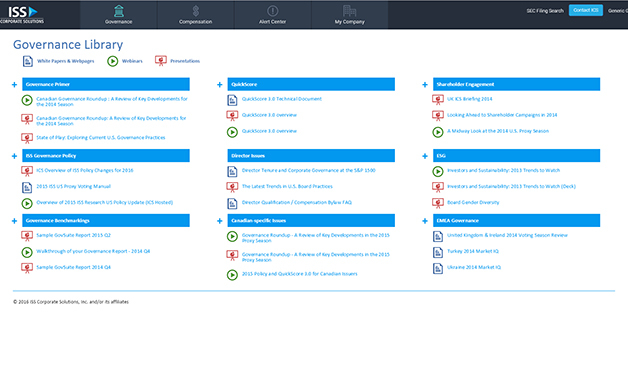 ICS’ Governance Suite is the most comprehensive solution available, with an extensive collection of data, analytical tools, and a dedicated advisor to help you optimize your corporate governance strategy, anticipate shareholder concerns, and craft cogent meeting agendas and proxy disclosures. Benchmark governance risk and uncover opportunities to maximize your appeal to investors. This document details the questions analyzed and rationale for inclusion in the factor methodology. Balancing business demands and shareholder preferences can be complicated and the amount of data required to make good decisions is tremendous. Voting Analytics is the most comprehensive source of U.S. mutual fund vote disclosures and top non-U.S. pension funds and large asset managers. Its robust database contains almost 60 million institutional voting records and is based on nearly a decade of vote results on more than 50 discrete governance topics, including executive compensation, board practices, corporate actions, director elections, and shareholder proposals and proponents. Voting Analytics helps issuers determine voting patterns and trends by monitoring and analysing institutional voting policies and historical shareholder meeting results. Stay up-to-date on the latest proxy voting issues and benefit from ISS’ corporate governance and proxy voting expertise with access to ISS historical proxy voting reports, research, and publications. An analytical overlay to ICS’ suite of data solutions, allowing you to stay informed about governance issues, trends, and best practices.